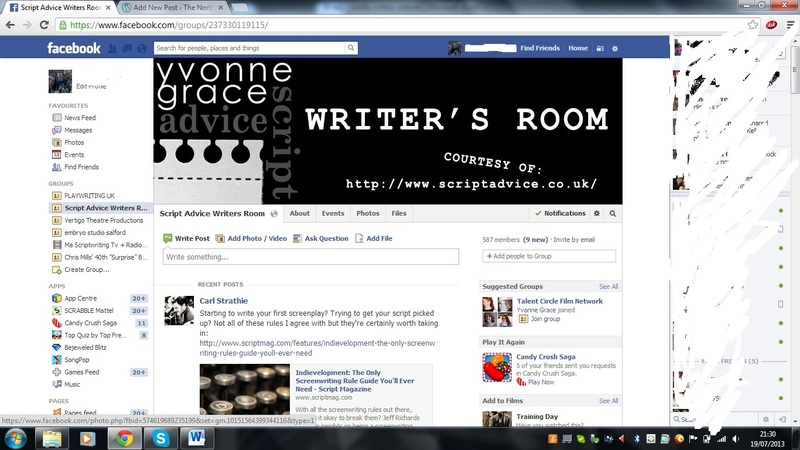 My favourite website for scriptwriters is Yvonne Grace’s facebook group Script Advice Writers Room. I’ve been a member of the group for the past couple of years and it really is a wealth of knowledge and advice for scriptwriters. Writing is such a solitary activity and I have found that having online support which is active on a daily basis has been a valuable part of my learning journey. Yvonne set up the facebook group as a companion to her main website http://www.scriptadvice.co.uk. It is not only to promote the work that she does but it really is a place for writers to chat, post links and discuss anything script related. I know if I have a burning question to ask about which is story related that I could post it on the facebook group and somebody would answer it in no time at all. That in itself is a valuable lifeline to be part of. Anybody else have some worthy writery websites that can help me out?